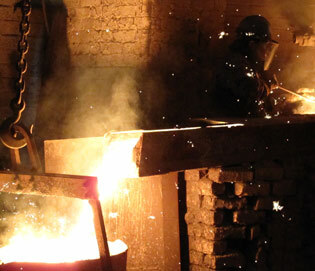 WB White Foundry's aluminium casting capability allows the casting of all grades of aluminium, zinc-aluminium alloys and copper based alloys, most notably gun metal and bronze. Offering high quality finished products that are excellent as stand alone pieces but that are also suitable for machining, WB White Foundry's aluminium plant extends an already very versatile casting service. WB White uses a Gas Powered Morgan Furnace to melt to a capacity of approximately 160kg of aluminium per hour. Producing large castings via the boxless method, this plant allows WB White Foundry to cast large aluminium and associated metal alloy products. 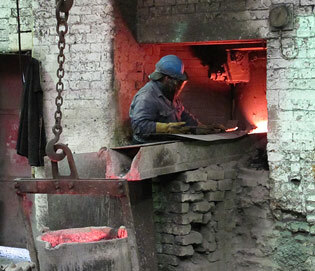 WB White specialise in Street Furniture, Architectural Castings and oversized ancillary castings. This process permits the manufacture of sizeable products with the practicality of significantly reduced weights when compared to the cast iron alternatives. This means that both traditional and modern styles can be cast with the flexibility to make them removable, movable or semi permanent, as well as being more suitable for finials, crests and adornments. 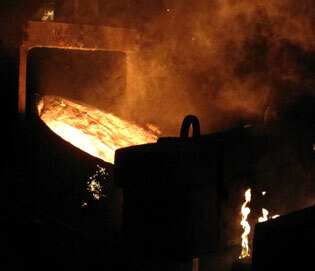 WB White Foundry's semi mechanised green sand plant produces small to medium sized castings. Ideal for smaller finials and accoutrements as well as engineering components and many other ancillary castings, this plant compliments the furan system and offers complete flexibility for our customers looking for aluminium castings. Compared to the sand casting systems employed by WB White which use temporary sand moulds made individually for each casting, the gravity die casting system utilises a permanent mould manufactured in either iron or steel. Die castings are ideal for the mass production of smaller castings where either a huge number of identical units are required or a very high quality finish is desired, or indeed both. WB White's sister company SG Castings, also have facility to cast in aluminium. Utilising two electric furnaces SG Castings manufacture cast aluminium products for a range of industries that include everything from the food and bakery industries (often using grades LM6 and LM24 aluminium) to cast aluminium bollards and other street furniture in any suitable aluminium grade.